Forbes published an article about the health benefits of coffee. Let’s get right to the good news: drinking coffee seems to reduce your risk of death from oral or pharyngeal cancer by about 50%. Drinking more coffee is better than drinking less, and drinking caffeinated (normal) coffee is better than decaf. 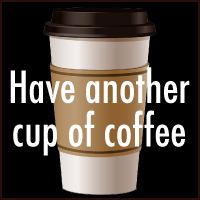 Have another cup of coffee - it's good for you! Forbes published an article about the health benefits of coffee. Let’s get right to the good news: drinking coffee seems to reduce your risk of death from oral or pharyngeal cancer by about 50%. Drinking more coffee is better than drinking less, and drinking caffeinated (normal) coffee is better than decaf. You can read the full article here while we drink another cup of coffee.